That's easy! "Ghost Walker" sejak Barbara Hably. 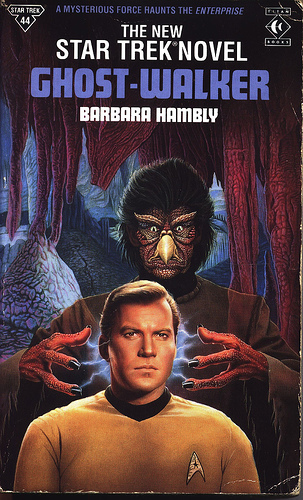 Published in 1991, it relates the story of TOS Enterprise being highjacked sejak an alien hostile. Without giving too much away, get this: Spock, McCoy, Uhura, Nurse Chapel and Kirk's Cinta latest Cinta interest must conduct a SEANCE to speak to a disembodied Kirk roaming the Enterprise! Crazy huh? anda gotta read this novel! vulcan glory and sarek, because they both give anda background information on spock's life. I just read a few weeks lalu the novel "Pathways" with the VOYAGER crew. This one would make a great episode. We learn alot of the background on the main characters and what makes them who they are.